China’s ruling Communist Party today unveiled a new leadership line-up led by President Hu Jintao, who won a second five-year term as the party boss to forge ahead with reform and opening up, but apparently without letting him handpick a successor of his choice when he retires in 2012. Chief Justice Iftikhar Mohammad Chaudhry has indicated that the Supreme Court may take up suo moto notice of the Karachi carnage during PPP chairperson Benazir Bhutto’s procession on last Thursday if the investigation currently underway failed to make any progress within next one or two days. In a unique honour, former President A.P.J. Abdul Kalam was today presented with the King Charles II Medal for his outstanding contribution to the practice and promotion of science in India. The US today handed over 30 helicopters to Pakistan under a $235 million deal to help build the country’s army aviation capability, particularly to conduct anti-terror operations in the restive area bordering Afghanistan. A pro-Taliban militant was killed and two others wounded in a botched attempt to blow up the office of a women’s rights group in troubled northwest Pakistan, the police said today. A magistrate in Papua New Guinea in the South Pacific was stoned to death after his car crashed into a refugee camp in the capital Port Moresby, local media reported today. Dozens of Turkish military vehicles loaded with soldiers and heavy weapons rumbled towards the Iraqi border today after an ambush by rebel Kurds that left eight soldiers missing and 12 dead. Al-Qaida leader Osama bin Laden called for Iraqi insurgents to unite and avoid “extremism” that causes divisions in a new audiotape aired today on Al-Jazeera television, trying to overcome splits by some Sunnis who have opposed the terror group’s branch in Iraq. Ending months of backroom politicking, the top echelons of leadership of the Communist Party of China (CPC) made an orderly group debut at the ornate Great Hall of the People here after their election at the first plenum of the 17th CPC Central Committee, with Hu overwhelmingly winning a fresh mandate as party chief for a second term. Belying the expectations of Hu’s camp, the newly elected Central Committee apparently denied the 64-year-old CPC general secretary the free hand to name his protégé Li Keqiang as his potential successor at the next party Congress in 2012. But in an apparent compromise, the party had on Sunday elevated Hu to the status of pantheon of leaders like ‘Chairman’ Mao Zedong, Deng Xiaoping and Jiang by enshrining in the CPC Constitution his pet vision of “Scientific outlook on development” to ensure a balanced and sustainable development and mitigate the sufferings of millions of poor Chinese peasants. Hu was also reappointed Chairman of the powerful Central Military Commission (CMC) of the CPC, the top military organ of the party. 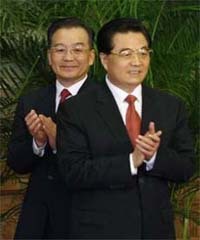 Hu succeeded Jiang Zemin as party leader at the 16th CPC National Congress in November, 2002. He was elected a member of the Politburo Standing Committee of the CPC Central Committee in 1992. In the pecking order of the CPC, Xi Jinping, 54, the Communist Party boss in Shanghai, was ranked ahead of Li, who is considered Hu’s choice. Xi, 52, is seen as a candidate of Jiang, also based in China’s commercial capital, Shanghai. The election outcome showed that despite his advancing age at 80, Jiang still wields considerable clout in the opaque Chinese politics, analysts said. New faces in the pinnacle Politburo Standing Committee of the CPC Central Committee are Xi Jinping, Li Keqing, He Guoqiang and Zhou Yongkang. They joined the nine-member echelon with the previous standing committee members, namely Hu Jintao, Wu Bangguo, Wen Jiabao, Jia Qinglin and Li Changchun, who are members of the Politburo Standing Committee of the 16th CPC Central Committee. “Comrades Xi Jinping and Li Keqiang are two quite young comrades,” said a beaming Hu dressed in dark blue suit in carefully chosen words while presenting them before reporters. Analysts say Xi is poised to succeed Hu when he retires in 2012 at the 18th Party Congress, held once in five years. Once Xi is appointed Vice-President in 2008 at the expected Chinese government reshuffle, that would put him in the race to succeed Hu as CPC general secretary in 2012. Li would then become executive vice premier, who could succeed Chinese premier Wen Jiabao in 2012, analysts said. The race for the all-powerful general secretary’s post could still be open-ended despite the current power equations, which emerged today, analysts said. India’s strategic relations are expected to get further fillip during the second innings of Hu who is all set to offer a red carpet welcome to Congress President Sonia Gandhi here on October 26. The Chief Justice made these remarks during the hearing of a case in which PPP senator and advocate Babar Awan had appeared to represent a client. He expressed condolences over the loss of life and injuries to a huge number of people. He agreed with Awan that a tragedy of this nature and magnitude had not occurred anywhere in the world since the 9/11 holocaust in 2001. He noted that poor party workers had been hit. Awan said the case was being investigated as a routine explosion and might be put on the back burner after some time. Meanwhile, interior minister Aftab Sherpao has rejected PPP chairperson Benazir Bhutto’s demand to enlist support of foreign experts in investigation. He said Pakistani investigators were quite capable of doing this job and no foreign help would be sought. Talking informally to reporters here, Sherpao recalled that assassination attempts on President Musharraf and Prime Minister Shaukat Aziz were also investigated by Pakistani experts. But former interior minister in the Bhutto government Gen Nasirullah Babar and some retired other generals have accused the government of attempting to hush up the case by declaring it as suicide blasts. Former army chief Gen Mirza Aslam Beg and two former chiefs of the ISI Gen Hamid Gull and Gen Asad Drrauni concurred with Babar that the blasts occurred from a planted bomb. Gen Babar said the government was relying solely on assumptions that a planted bomb should have kept a big crater. He said this was essentially not the case always. He described the blasts as an extension of the May 12 massacre when President Musharraf and his staunch ally, the MQM, blocked the entry of the Chief Justice for fear the expected massive public reception would expose the MQM’s claim of monopoly control over Karachi. Babar said the establishment got scared by the unprecedented welcome accorded to Bhutto and tried to halt the PPP bandwagon that posed a threat to the ruling coalition in Sindh and Punjab. Bhutto and other PPP leaders had also expressed no confidence in the chief investigator, who is leading the probe. They noted that he was involved in the police firing that killed Bhutto’s brother Murtaza Bhutto in 1996 and led to her ouster a couple of days later. Bhutto told reporters in Karachi that her demand for assistance from foreign experts was reasonable and would help in the investigations. “We want the government of Pakistan to seek the assistance of the international community,” she told a group of foreign reporters at her Karachi home. “They have anti-terrorism experts who have the technical expertise to investigate attacks of this nature,” she said, adding that she had discussed the issue with the USA and Britain. Lord Martin Rees, president of The Royal Society, presented the medal and a scroll to Kalam in the presence of a distinguished gathering, including NRI industrialist Lord Swraj Paul, Lord Karan Billimoria, chief of Cobra Beer, Asoke Mukerjee, acting high commissioner of India to the UK, and Lord Meghnad Desai, a leading economist, at the Royal Society here. Kalam is only the second leader to receive the coveted award which was constituted in 1997, the first being Emperor Akihito of Japan in 1998. Thanking the Royal Society for bestowing the honour on him, Kalam said he considered it as a unique honour “to India and its people”. Kalam, himself an eminent scientist, said he was presently working on two areas that have a mission potential to have a positive effect on the societal development. They are the energy independence and world knowledge platform. Presenting the silver-gilt medal, Lord Rees described Kalam as an “ideal recipient” of the award for his contribution to the defence programme of India as scientific adviser to the government and his Technology Vision 2020. Twenty-six Bell 412 EP medium-lift, twin engine helicopters and four refurbished Cobra helicopter gunships and associated equipment were handed over to the Pakistan Army in a ceremony at Qasim airbase near Rawalpindi by US Ambassador Anne W. Patterson, a statement issued by the army said. The Post Courier newspaper said senior magistrate Ivo Cappo was killed on Saturday night when he lost control of his car as he drove home from a hotel, and ran into the camp on Ela Beach. Turkey’s foreign minister said his country would pursue diplomacy before it sends troops across the rugged frontier. The military said it had had no contact with the eight soldiers after Sunday’s clash and said 34 guerrillas had been killed so far in a counter offensive. A pro-Kurdish news agency said the eight were captured a claim that would make it the largest seizure since 1995, when guerrillas grabbed eight soldiers and took them to northern Iraq. A senior rebel commander, Bahoz Erdal, said the soldiers were in rebel hands, the pro-Kurdish Firat News Agency reported. “Right now, these soldiers are hostages in the hands of our forces,” Firat quoted Erdal as saying.